Heat pumps transform heat from a lower temperature to a higher temperature, using energy with a high exergy level. Exergy is the ability of energy to perform work. Typically, the energy supply for heat pumps is electricity. The most known applications are household refrigerators. In the low pressure part of the heat pump, liquid working fluid is heated and changes to a vapour (evaporation). The evaporator obtains the needed heat from ambient air, earth, water or exhaust air. A compressor raises the pressure of the working fluid and, at the same time, the temperature. Most common small capacity compressors are piston machines or scroll compressors, normally driven by an electric engine. On the hot side of the heat pump, the heat is transferred from the working fluid to another fluid in a heat exchanger (condenser). In this way, the working fluid condenses to a liquid. The extracted heat can be used for space heating (by supply air or radiators) or DHW heating. The useful heat is approximately equal to the sum of the heat gains in the evaporator plus the driving power for the compressor. The return of the working fluid to the evaporator is controlled by an expansion valve. In normal situations, no working fluid leaves the heat pump since it is a closed circuit. The environmental impact of heat pump heating systems is dominated by the source of the electrical power. If the power production is dominated by regenerative energy (that is, water power), the negative environmental impact is much lower than is the case where power comes from coal-fired or nuclear power plants. If the refrigerant leaks, this also has a negative environmental impact. The global warming potential (GWP) gives the atmospheric thermal impact in relation to CO2. The direct ozone depleting potential (ODP) gives the impact against atmospheric ozone. Most common refrigerants are fluorinated hydrocarbons as R134a or mixtures as R407c and R410a. They have a high GWP and no ODP Older heat pumps used chlorinated hydrocarbons such as R22 or R12 with a high ODP These are no longer allowed. New heat pumps also use pure hydrocarbons as R290 (propane) or CO2 without ODP and with a small GWP. But their use is more difficult because they are flammable (R290) or must operate under significantly higher pressures. Heat pumps used in low energy houses often use the ground as a heat source. In effect, the ground stores solar energy from summer to winter. At depths of 2 m and more the ground temperature begins to even out to the annual average temperature. A mixture of water and glycol are circulated through the pipes to extract this heat. Examples also exist where the refrigerant is circulated through the buried pipes (direct evaporating systems). The most common configuration is horizontal pipes, buried 1.5 m below ground with a horizontal separation of 50 cm. The resulting heat extraction from the ground is in the range of 15 W/m to 30 W/m. As an alternative, the pipes may be vertical, normally with a maximum depth of 100 m and a heat extraction from the ground in the range of 30 W/m to 60 W/m. 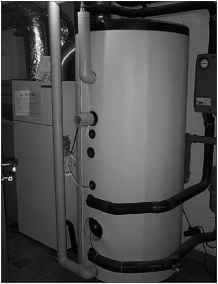 If the heat pump only provides space heating, systems without a storage tank are possible in high-performance houses (Afjei et al, 2000). For example, the thermal mass of a floor heating system can serve as storage. This is feasible because highly insulated houses cool down very slowly. 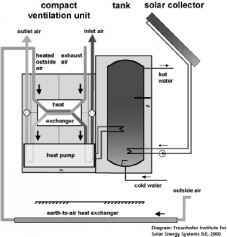 If, however, the same heat pump also heats DHW, a storage tank is needed. This tank could also be the storage for a solar collector. Figure 12.8.1 illustrates a typical heat pump system with earth-buried pipes. The heat is distributed by radiators or by supply air via a heat exchanger in the supply air stream. The ventilation system with heat recovery is separate from the heat pump system (see Figure 12.8.2). 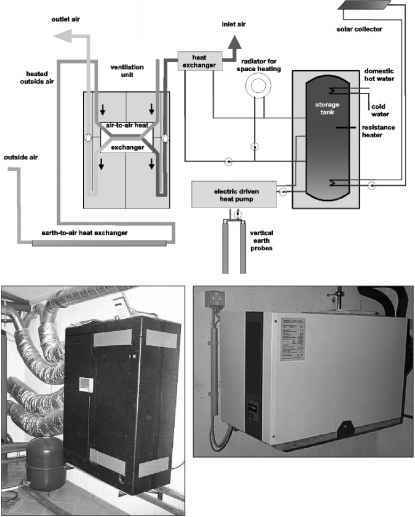 A compact heating and ventilation unit was developed by industry with support from Fraunhofer ISE for application in solar passive buildings (Buhring, 1999). These ventilation units not only have an air-to-air heat exchanger for passive heat recovery, but also include an additional exhaust air heat pump. This removes the residual heat from the exhaust air and uses it for space heating and domestic hot water (Buhring, 2001). The units can also be connected via a storage tank to a thermal solar system, which is designed to meet the hot water demand fully in summer (see Figure 12.8.3). 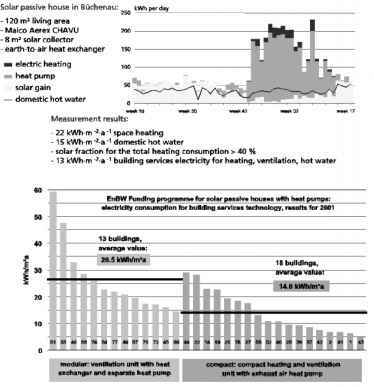 Compact heating and ventilation (HV) units already command 30 per cent of the market for energy supply systems serving German 'passive buildings' (Feist, 2001). A large proportion of the 78 houses monitored by the Freiburg ISE also used such a system (see Figure 12.8.4). Energie Baden-Württemberg (EnBW), the regional power supplier, sponsored the Fraunhofer ISE to monitor 78 solar passive houses in Baden-Württemberg. Monitoring results of a demonstration house in Büchenau are shown in Figure 12.8.5. A compact ventilation unit with an integrated exhaust air heat pump, earth-to-air heat exchanger and solar collector serve this house with 120 m2 living area. The measured annual space heating load of 22 kWh/m2a, the domestic water heating load of 15 kWh/m2a and the ventilation and control electricity are covered by 13 kWh/m2a of electricity total for all the technical systems of the house. The annual COP of the heat pump reaches 3.2. In Figure 12.8.6, the measurement results in the EnBW monitoring programme are summarized. On the left side is the group with modular earth-coupled heat pumps and on the right side, the group with compact HV units. In the first year the modular group has a significantly higher electrical demand because of problems with some control parameters. In the second year, the modular systems performed better, but were still less efficient than the compact systems. Electrical-driven heat pumps can be a highly efficient and economical solution to supply heat to high-performance houses. 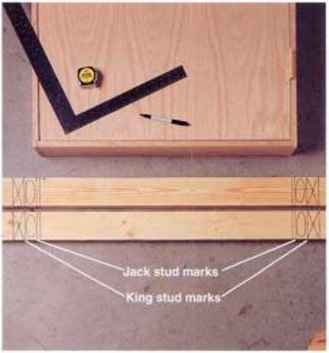 Integrated systems are more reliable than systems assembled from components that require onsite adjusting.